10 centimes: Bee and saffron flower. 20 centimes: The water lily and water protection. 5 dirham: Mosque of Hassan II, an architectural feat of the 20th century. 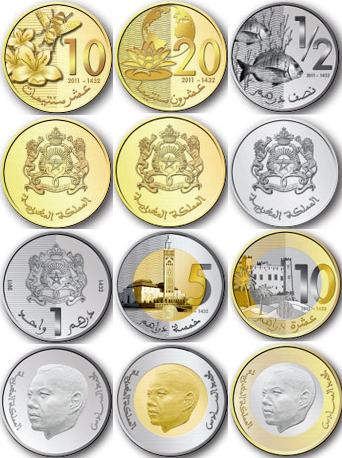 10 dirham: Kalâat M’gouna, a town in the heart of Morocco. * The species of the fish is not given. Another beautiful collection of African coins. It would be interesting to know what the motives stand for. hi,is it legal to go out from morooce with big countity of coins? Now is no longer banned, and I even found that someone brought out hundreds of coins of 1, 5 and 10 DH in 1999, while that was banned.